Xiaomi is a company that has already launched the cheapest Snapdragon 835 smartphone i.e., the Mi6, and it seems the only competitor to this flagship is the upcoming OnePlus 5. In 2015, we saw the Xiaomi Mi4C being launched as a low-end version of the Mi4 and the same thing happened last year as the company announced Mi5C. This year, it seems that the story will continue as a new Xiaomi device has been spotted on GFXBench, named as the Xiaomi Jason. Sources have revealed that it is none other than the Xiaomi Mi6C. And hey, check out the CUBE Thinker i35 Review and Specs. 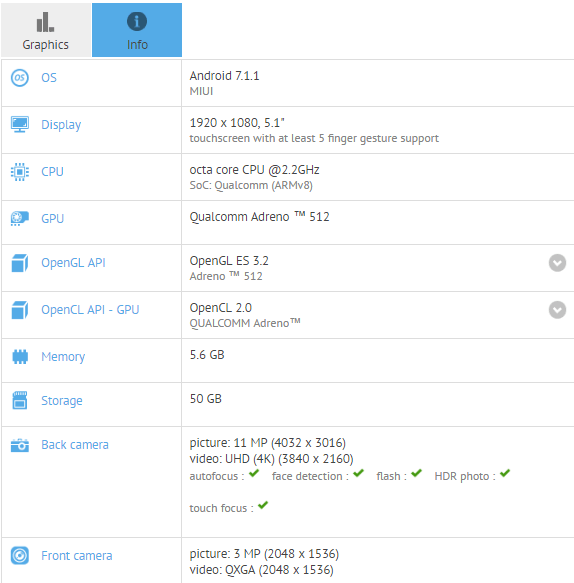 Talking about the specifications leaked via GFXBench, the phone has a 5.1-inch Full-HD display and is powered by the latest Qualcomm Snapdragon 660 Processor clocked at 2.2GHz along with Adreno 512GPU. There is 6GB of RAM along with 64GB internal storage space. Coming to the cameras, the phone has a 12MP rear camera with 4K video recording capability, and there is 4MP front-facing camera. Android 7.1.1 runs out of the box with Xiaomi’s own MiUI. As per the specifications, it seems like the Xiaomi Mi6C is going to be a powerful mid-range smartphone. As per the specifications, it seems like the Xiaomi Mi6C is going to be a powerful mid-range smartphone. There are no details regarding the design of the smartphone, but hopefully, we will get to know them pretty soon. Let us know your opinions about the specifications of Mi6C in the comments section.